Since we got our hands on the Galaxy Tab 7.7 we were eager to do our battery tests. We were pretty curious to find how the first Super AMOLED Plus-touting display fares, compared to its LCD rivals. Coming with a 5100mAh battery the Tab 7.7 has a theoretical advantage over the 7-inch Samsung slates, but it also has a larger screen with more pixels to power. So, we did what we usually do – 3G talk, web browsing and video playback tests and we are now ready to share the results with you. According to Samsung’s official data the Galaxy Tab 7.7 should endure just 20h of 3G talk time on a charge, but oddly enough, our Tab 7.7 did much better – 25 hours and 45 minutes. As expected the web browsing performance wasn’t as impressive. The predominantly white web pages took their toll on the Super AMOLED Plus screen and the Galaxy Tab 7.7 lated a tad less than 7 hours. The Honeycomb browser might also be a part of the reason for the unsatisfactory result here – we’ve seen other Samsung devices get improved browsing endurance after the ICS update. Finally, the Samsung Galaxy Tab 7.7 did pretty well on the video playback lasting 11 hours and 37 minutes. As you can see the Super AMOLED Plus screen does help here. 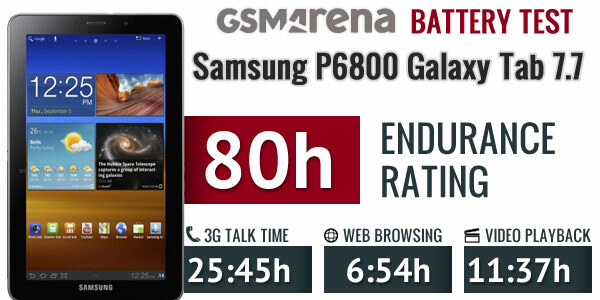 The endurance rating the Galaxy Tab 7.7 managed is 80 hours. This means that you will need to charge your slate every 80 hours if you use it for an hour of telephony, web browsing and video playback every day. The results are more than adequate for a tablet so you should have no worries about the battery performance at all. Not to mention that things might get even better once the Tab 7.7 gets its due ICS serving. 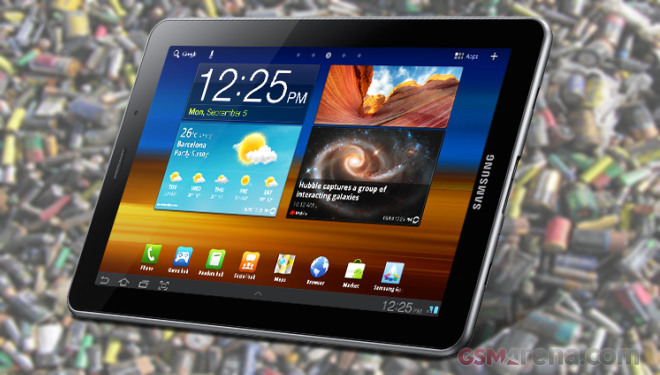 For answers on your other Galaxy Tab 7.7-related questions you can read our review right here.